The GBP/USD pair traded with a mild negative bias through the Asian session on Tuesday, for the third consecutive day, and is now holding weaker below the key 1.40 psychological mark. 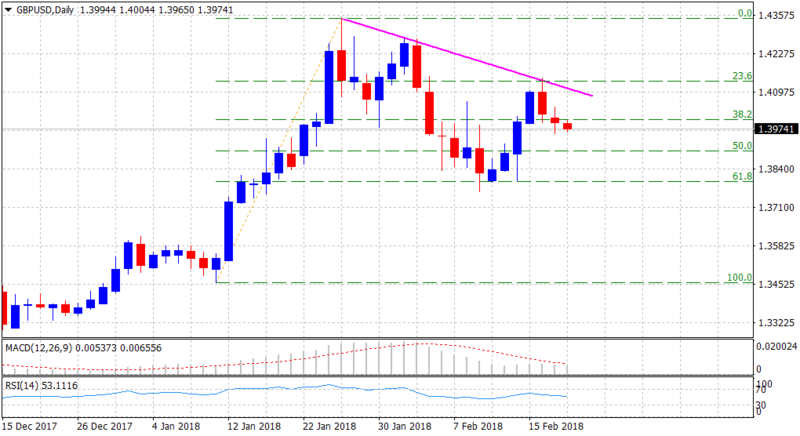 The US Dollar has now started showing some signs of robustness and has been one of the key factors behind the pair's sharp retracement from a short-term descending trend-line resistance, tested on Friday. Adding to this, uncertainty surrounding the upcoming Brexit talks was further seen denting sentiment surrounding the British Pound. Hence, today's key focus would be on the David Davis' speech in Vienna, where he will attempt to set out his vision for a future post-Brexit economic partnership with the EU and might eventually influence the GBP price dynamics. On the economic data front, the UK CBI industrial order expectations data might provide some short-term trading opportunities ahead of Wednesday's key UK jobs data and the FOMC meeting minutes, which would drive the pair in the near-term. From a technical perspective, yesterday's break below the 1.40 handle, marking 38.2% Fibonacci retracement level support of 1.3458-1.4345 upsurge, now seems to point towards additional near-term weakness. Hence, a follow-through selling pressure has the potential to continue dragging the pair towards 50% Fibonacci retracement level support near the 1.3900 handle. On the flip side, the 1.40 round figure mark now seems to act as an immediate hurdle, above which the pair is likely to aim towards clearing an intermediate resistance near mid-1.4000s before eventually darting back towards the descending trend-line resistance near the 1.4100 handle.